The Patchwork Foundation, a charity that aims to highlight best practice in under-represented, deprived and minority community engagement, held its MP of The Year Awards to that end. An MP from each party is nominated by grassroots community organisations which goes to a judging panel. 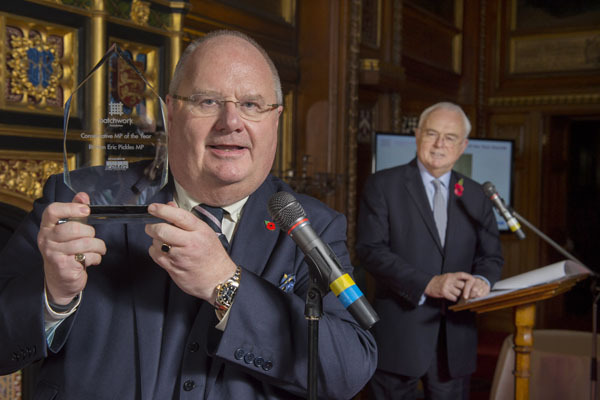 The Rt Hon Eric Pickles (Secretary of State for Communities and Local Government and Minister for Faith) won the conservative spot but couldn’t attend the actual evening event so we did his photograph a little earlier in the day. The venue is the Speakers House, an amazingly ornate Gothic Revival interior but lit with an equally gothic unrevived lightbulb, I’d say, so I had to set up the lights. I asked Martin Lewis who was to do the comparing to stand in at the lectern to give the photograph more depth and context (well, to make it look like how it may have looked on the night).